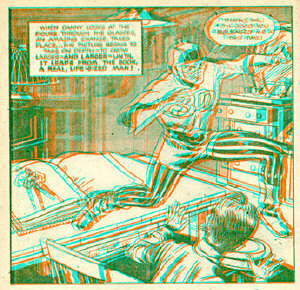 Complete scans of Jack Kirby’s Captain 3D, a one-shot 1953 comic book that, despite its age and the poor-quality of the printing, still works perfectly with a standard pair of red-blue ‘3D’ glasses. The s-3D effect really suits Kirby’s dynamic artwork. Talking of comics, the excellent PhD Comics webcomic is now free to syndicate in academic magazines and newspapers.